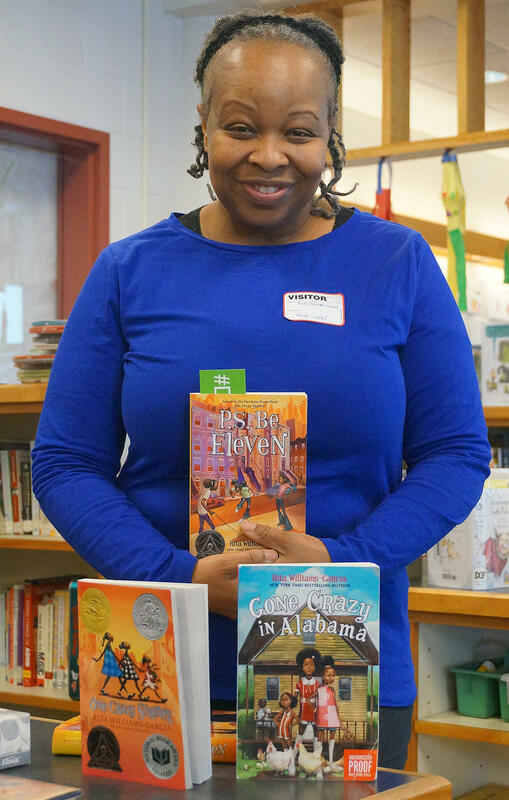 Author Rita Williams-Garcia stopped by the Moretown School to meet a group of fourth, fifth and sixth graders reading "P.S. Be Eleven" with teacher-librarian Meg Allison. The Gaither sisters got to know their mother in the first book in the series, called One Crazy Summer. In P.S. Be Eleven the oldest sister, Delphine, writes letters to her mother, Cecile. And her reply always comes back with a reminder not to grow up too quickly. Like the Gaither sisters, author Rita Williams-Garcia also lives in New York City. And she spends time in Central Vermont teaching at the Vermont College of Fine Arts. While she was here, she made time to stop by Moretown and answer questions from some of her young readers. Madison Byrd: Why did you name it P.S. Be Eleven and how come in the letters it said “P.S. Be Eleven” What inspired you to do that? Rita Williams-Garica: Ok, well, It occurs to me that Ceclile has missed out on a lot of Delphine as she was growing up. So she really got to spend time with her as an eleven-year-old, and I bet you she wished she had more of that time. But the main reason why I do that is because Delphine is writing, sometimes angrily, to her mother. And then her mother will write back the answer and explain things. And so she’s always kind of saying, “You are eleven years old. Enjoy being eleven while you can. Don’t rush it.” ... Childhood is a gift. And if you could just enjoy it for as long as you can, then that’s a gift that a parent would want to give to a child. And I think that’s why she says “be eleven”– even when she’s twelve. Madison Byrd: Why does the story take place in 1969? Rita Williams-Garcia: Actually, I was around during that time. I was near your age. I was about, let’s see, I think I was twelve in 1969. And what I remember was that so many different things were happening. I guess just like now. There were so many different things happening in the news, and I was always watching the news. But I didn’t have to see the news to know that things were happening. Things were changing in my neighborhood, they were changing everywhere. You had more women going into the workforce, which was different. You had girls who wanted to play sports that were traditionally boys’ sports, so you had Title 9. I wanted to play football, so I connected to that. You had strife between people that didn’t understand each other, and so you had riots. There’s all kinds of things. And you had protests. Lots of protests. So there was so many things going on I figured, okay this is a good place to tell a story because there is an awful lot of change. And when things change, people change. And so I wanted to think about how all of those changes affected these three girls – especially Delphine. 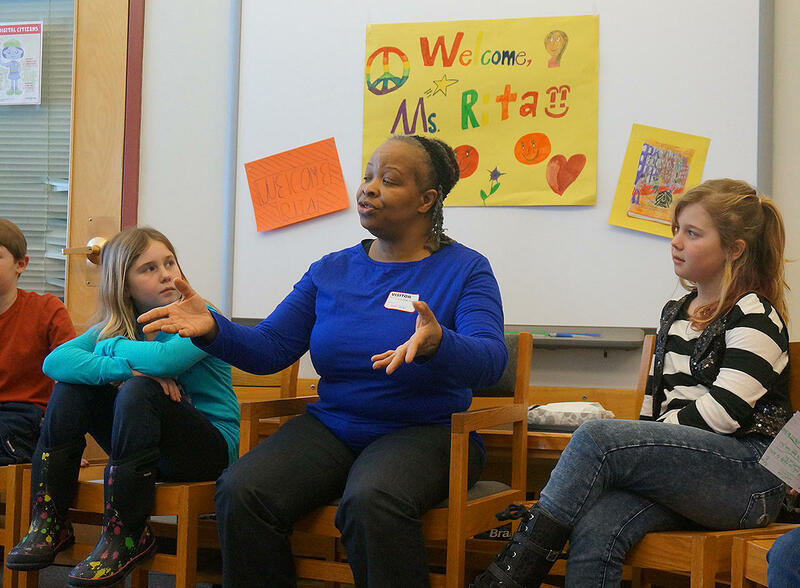 These Moretown School students had many questions for Rita Williams-Garcia! Hannah Ladieu: What inspired you to write P.S. Be Eleven? Rita Williams-Garcia: The girls met their mother and now they were going to be in their home environment. And I would think that, wouldn’t one of them, or at least Delphine the viewpoint character, wouldn’t she wonder why can’t they be together? Why couldn’t their mother and father be together? And so, when her father starts whistling “My Girl” and wearing cologne and announces that there’s someone special in his life. Not only special, but then she’s going to become a part of the family. That then creates a kind of an obstacle for Delphine, who really does want her parents to be together. And I think that a lot of us do experience that. Maybe our parents do love each other, but they can’t be together. And so that might be very hard to understand. So I think I wanted to talk about how that family is getting ready to change, just as the neighborhood is changing and the world around them is changing. I thought, let’s talk about personal change as well. Cami Rocheleau: Do you have any siblings? Rita Williams-Garcia: I have an older brother, Russell, and an older sister, Roselyn. And so we are Rita, Roselyn and Russell ... and so that would make me the youngest. And being the youngest they would say, “Oh, she’s the baby. She gets everything and she doesn’t get into trouble.” But, being the youngest I would say, “You know, they’re always picking on me, but one day I’m going to get bigger and taller and they’ll see. I’ll show them. So, we played a lot together and, well, we fought a lot together. We were very close. Very peas in a pod. Rita Williams-Garcia kept the students engaged with her stories and wisdom. Eloise Harris: Why did you choose the Jackson Five as the band? Rita Williams-Garcia: Why did I choose the Jackson Five? Oh my goodness gracious ... So, okay. Back when I was a kid, a lot of the groups that I listened to, and kids in my neighborhood, we listened to a lot of Motown. But if you look at the Motown artists, they’re like old men. Well, to us they were old men. They were probably like 25, 30, you know, uhgh. But when we finally saw kids who were like our age, we just screamed and went crazy. So the Jackson Five were kind of like one of the first boy bands that appealed, especially to African-Americans. They had a universal appeal, but especially to African-Americans. And like the first real crushes we had on boys who looked like boys who we might see in our neighborhood. So that was a big part of it. And also, my sister and I wanted to go to Madison Square Garden to see the Jackson Five. And my mother said, “Are you kidding? We’re not Rockefeller, we don’t have all of that money.”... So I wanted my girls to go. I wanted Delphine, Vonetta and Fern to go. Jonah Busker: Did you have a favorite writer when you were growing up and why? Rita Williams-Garcia: I loved Beverly Cleary because she had, kind of a neighborhood of stories. I felt like I was in her neighborhood, and knowing the stories and the kids. And I really liked that the kids really struggled. Ramona could be a bit of a pest. And I had an older sister and I was kind of a pest ... Ribsy was one of the first stories that I felt like I could feel myself just really in the story and loving that dog. And that he was not a perfect show dog, but just a kind of a scrappy dog. So I just loved how she captured, not the most perfect people but the most real people. I really liked that. Author Rita Williams-Garcia with her three novels about the Gaither sisters. Nathan Kudriavetz: Do you think you’re going to make another book onto P.S. Be Eleven? Rita Williams-Garcia: Yes I did, and it’s called Gone Crazy in Alabama. And it actually follows the girls – well they’ve been to Oakland, they’ve traveled back to the East, and now they’re going to go South and visit with Big Ma and her mother. So we get to see all these different generations of the Trotters, Gaithers and Charles. And that’s what this book is. The kids at the Moretown School got to see an advance copy of Gone Crazy in Alabama. It will be released in April, about the time that students in Vermont will be voting on the Dorothy Canfield Fisher Award for which P.S. Be Eleven is nominated.